Brief Synopsis – The story of the famous Frenchman poet with a nose for mischief who helps his friend woo the woman he himself is madly in love with. My Take on it – Ever since I saw the Steve Martin adaptation of the story (Roxanne (1987)) of Cyrano 27 years ago, I have been quite curious as to how good it was compared to the original with Jose Ferrer. 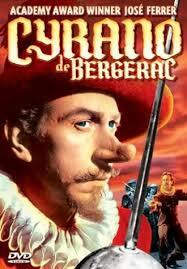 This is a very good story but Ferrer as the main character is what makes this movie so interesting. He won an Oscar for this role, which makes sense because he also won a Tony for the same role a few years earlier. it was actually the role he was most notable for in his entire career. Watching this actually makes me appreciate Roxanne (1987) even more because now I understand more completely the meaning of many of the references. The problem with this movie is the fact that there are a few scenes that are slow and boring. Thankfully they are complemented with some extraordinary scenes that make this still worth watching despite the aforementioned lulls. The best scene us replicated by Martin in Roxanne (1987) where he explains to a would be insulter better insults for a ma with his kind of nose. Unlike in Roxanne (1987), this happens towards the beginning of the movie and it works so well. I must confess that I always attributed this whole scene to martin’s genius, but he just made it even funnier. As much energy that Ferrer injects into the character, Martin’s version of Cyrano is so much more descriptive and interesting. Bottom Line – Very interesting premise that has lulls in its points of Ferrer is great, but I still believe Steve Martin gave the character much more life. Recommended!